One of the most exciting things every traveler dreams of experiencing in a foreign country is its traditional food and delicacies. Of course, today even the smallest cafes have their own websites with customer’s reviews and recommendations, but wouldn’t you rather plunge into a truly authentic experience and try everything yourself instead of relying on somebody else’s opinion? 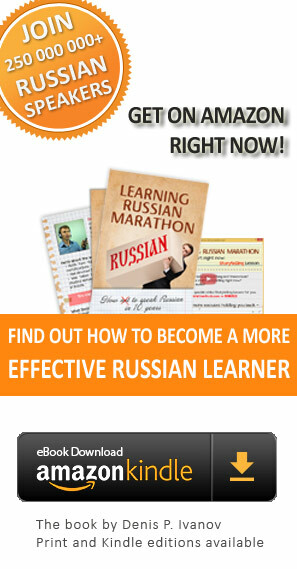 Wouldn’t you like to build up your own idea of Russian cuisine? Though you probably would not want to get a food poisoning while going through all the authentic food tasting, right? So, here’s a few pointers for you to make your journey full of tasteful adventures. Of course, food habits of another nation are always interesting. But we should not forget that еда (food) during the trip is not only exotic entertainment. This is also a matter of saving money and feeling good! 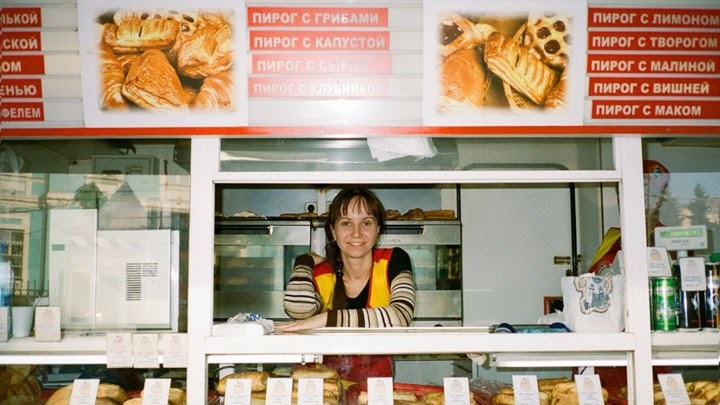 Do you want to know where locals eat in Russia? They eat at home! It is nice to go to a ресторан (restaurant) or кафе (cafe) to chat with your friends or to celebrate holidays. A ресторан is usually a more expensive place and a кафе is a bit simpler and cheaper. You can try traditional Russian, Ukrainian, and Caucasian кухня (cuisine) in specialty restaurants, but don't forget that unusual food can be hard on the body. Always check the цены (prices) in the меню (menu), because sometimes it can be extremely дорого (expensive) to eat out at a good restaurant, especially in Moscow. In order to save on your daily meals, you can find a столовая (canteen). 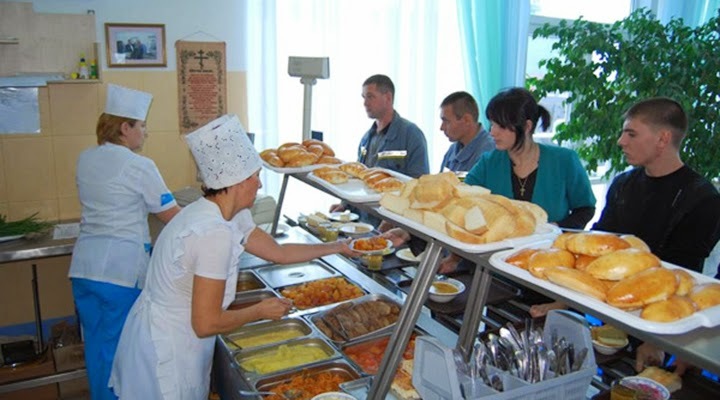 A столовая is a self-service place at some organizations where staff members go to get their обед (lunch). 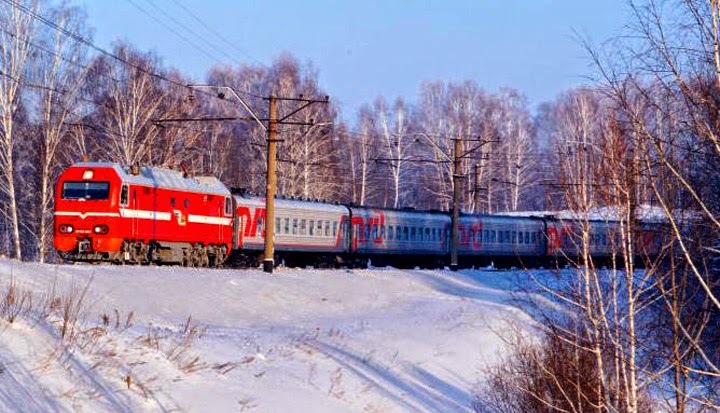 If you feel like diving into real-life Russian, a столовая is your best choice. 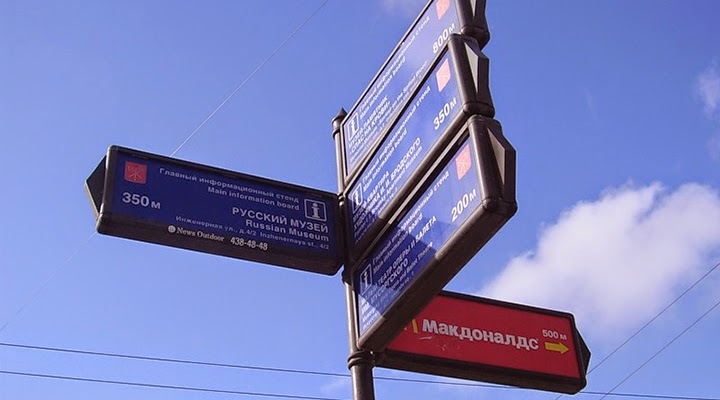 Of course, you can avoid using any Russian by simply pointing at different types of food you'd like to get, but where else would you get such a great chance to get involved in a real-life conversation in Russian? However, speaking a foreign language, especially in a crowded place, can be (and usually is) quite stressful. It might leave a negative imprint on your language learning process and you might not want to speak this language ever again! I think you wouldn’t want that, right? There are some proven techniques that help you break this language barrier and make language speaking a smooth and stress-free process. So, what are those techniques? Just drop me a message if you’re interested and I promise to help you out! 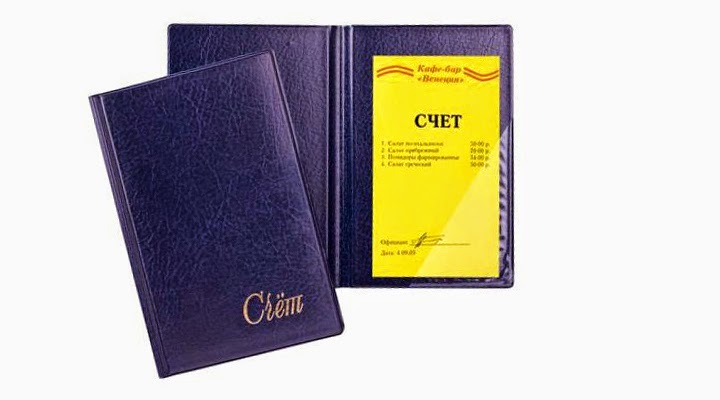 You can ask for the bill in a restaurant by using the phrase: счет, пожалуйста (the bill, please). If you want, you can leave a чаевые (tip), though this is not a must. An old legend says that in Russia men always pay for women in restaurants. 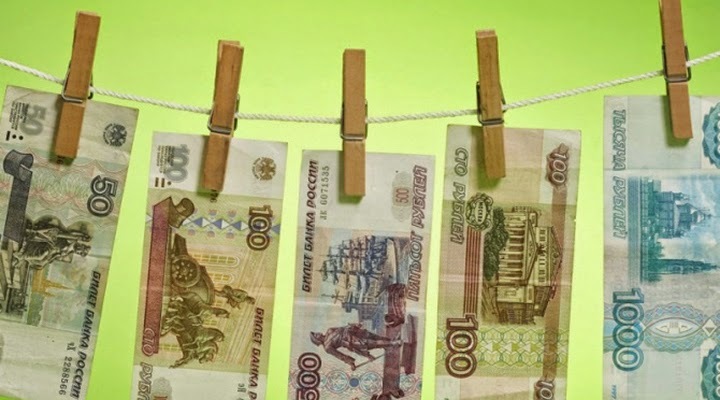 This information is a bit outdated: paying the счет (bill) by gender is only common on a romantic date. Usually обед (lunch) in cafes and restaurants is fashionably called a бизнес-ланч (business lunch). 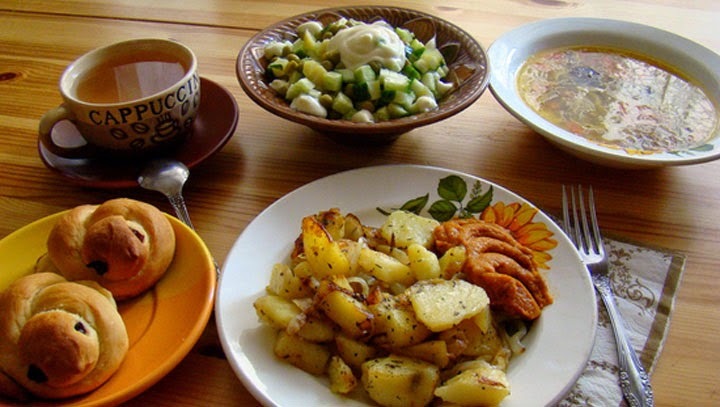 A standard good обед (lunch) includes: первое блюдо (first course) – soup; второе блюдо (second course) – meat or fish with a side dish; always чай (tea), кофе (coffee) or компот (compote — a drink of stewed fruits). In ресторан, кафе and столовая you should not forget about being careful, since отравление (food poisoning) is quite common. 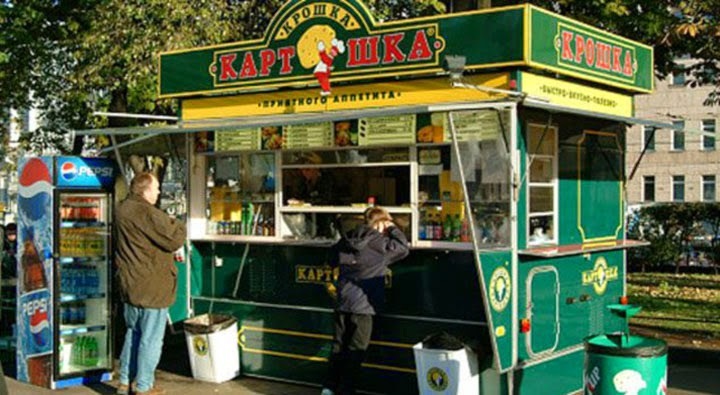 The biggest risk of getting отравление is in Japanese-style restaurants and in small street booths, for example, those selling хот-доги (hot dogs). Фаст-фуд (fast food) in Russia is not just unhealthy for you, it can also be dangerous! If you want to and can cook for yourself, in any food store you can find продукты (foods) that are very similar to the European ones. For Americans and Australians, some продукты will probably seem exotic. 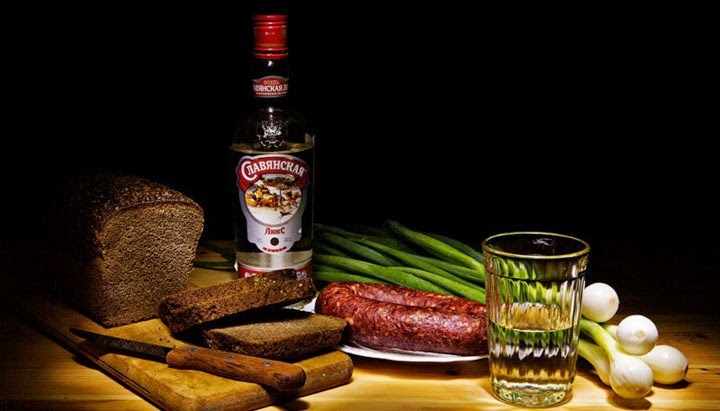 The most stable stereotype about Russia is related to алкоголь (alcohol). Not a lot of people know that the culture of using алкоголь in Russia is very different from the Western one. Drinking vodka without закуска, that is, without a lot of food, is a sign of low social status and even alcoholism. Do not do as some locals do: drinking водка (vodka) and even пиво (beer) in the streets and on public transport is prohibited by law. If a stranger asks you to выпить (drink alcohol), do not consider this to be Russian hospitality. It could be a criminal. The correct answer will be: Я не пью (I don't drink).